Well, I had to hire a contractor to do a job that was a bit too big for me, even when I am well. When that was done, he asked if there was anything else he could do. The exterior basement door was sticking because of some settling and the hinge screws getting loose in the wood after 125 years. I showed him the door and figured he would understand what was needed. Clearly, fill the holes with structural filler and adjust the shims. After all, he was a professional. I had to take a call from work and do a quick fix for them. Less than an hour later, I returned to find he’d smashed off (not unscrewed) the antique cast iron steam-age hinges and put some modern, thinner, plated, light weight hinges in the original mortises! He was about to shave off some of the wrong side of the door when I intercepted him. He left for lunch. Aarghh! Had he checked with me, I would have explained that the hinges themselves were not the problem. And clearly he has no idea what the market is for genuine steam-age hardware in usable condition to restorers, collectors, and steam punk folks. So rather than just cry about split milk, I thought I’d fume about it here, and share a snapshot of the piece that I was able to pull out of the trash. The Object at Hand is therefore the remains of this hinge from 1890. Wear ANSI-approved safety goggles during use. proximity to heart pacemaker could cause pacemaker interference or pacemaker failure. to cause cancer and and birth defects or other reproductive harm. Let’s set aside that I went to Harbor Freight; I do know the quality of their tools. I’ve been mail ordering from them since they only had an outlet in California, over a decade before the Web. But here we have a hand held flashlight that uses significantly less power than the old EverReady flashlights that we got for free with a two-pack of “D” batteries back when I was a kid. I’m old enough to have gotten the ribbed metal flashlights, before the orange plastic. Those rusted away when a battery leaked. Let’s begin with, safety goggles to use a flashlight? Really? This is not a laser pointer, nor does it have the capability to explode. The alkaline batteries that one would find in here cannot be made to explode unless you throw them in a pretty hot fire. Maybe the flexible plastic hook that swings out from the back could do eye damage during roughhousing? Pacemakers? Granted, they probably use a switching power supply to boost the voltage for the LED matrix. That is, this device probably does produce a barely detectable electromagnetic field. Probably orders of magnitude less powerful than a cell phone. But technically it does produce some radio noise, and by law that means it must need a warning. I suppose. Then there are several warnings about how to use batteries that I would have thought most kids old enough to read would already know. But what they don’t tell you is, What Kind of Batteries does it need? And finally, because of California, a warning about the minute trace of lead one finds in brass. Brass is the group of copper alloys with 55-75% copper with most of the rest being zinc. As with any metal outside of the semi-conductor industry, it will have small traces of other elements, including lead. The (WAG) gram of brass in this flashlight would have up to about 0.004 grams of lead. (Here’s an actual analysis of some unspecified brass alloy). But that trace of lead is in there because the extreme chemical processes used to purify the copper and zinc were unable to get the lead out. What are the odds that anything you could do would extract any measurable amount of it? IMHO, this warning label is somewhere between specious and laughable. Yet apparently required by law in California. Good luck to those members of our species who may need it. How many of you remember those old, carbon-paper credit card receipt machines? Revel in the solid “Ka-chunk chunk” sound as the cashier strained to run the slider back and forth, and the waste can full of booklets of carbon paper pulled from the right side of the sandwich of receipts. As a kid I was allowed to take some of those carbons home from stores, to play with fingerprints, and to use for stenciling. Back then, folks didn’t worry so much about identity theft. But have you even seen one of those machines in the last decade? Today’s Object at Hand is a new debit card, complete not only with a magnetic strip (tech from the 1970’s) but also a somewhat secure chip (based on the late 1990’s tech now considered obsolete in Europe). And, what is this? It still has the 1950’s legacy support of embossed information! Why, you may well ask, do I make a point of this? I like a thin wallet. The embossing increases the thickness of each card by 50%, and the friction to drag it out of a wallet pocket by noticeably more than that. It wears out the pocket or adjacent cards faster, as well as frustrating the user when too many get packed in there. And it serves no (expletive) purpose. Well, little potential purpose. Had I a flat card, and needed to purchase from some Luddite (who also does not take cash, or checks, and has neither the free stripe reader or the cheap chip reader available to anyone with a smart phone), they would be forced to hand write my name and card number on their multi-part receipt form. I’d happily do it for them. As I was putting up lights for the Solstice/Yule/Christmas season this year, I found that my porch light would not work right. I had unscrewed the bulb to screw in an outlet to power the porch-hung wreath, and could not make it work. I had replaced a (CFL) bulb a month earlier, and suspected that the fixture rather than the bulb was at fault. Now, I was sure of it. So I used an alternate source for the season. But then we had a warm day in January, so I set up a ladder and took down the light. Yes, I first identified the right breaker (that took a few tries) and shut off the power. The fixture seems to be from the 1940’s or 50’s. I had put a dusk-to-dawn sensor on it in 1990. Birds had nested upon it, and insects apparently made themselves at home behind it. So down it came, and I worked out how to disassemble it. The screws were rusty, but functional. It needed a good cleaning. But as I took it apart, it became apparent that the problem was not the wobbly nature of the light socket, but rather that a tubular rivet in the interior of the socket had fatigued away, failed. This was the critical problem. Here you can see the two rivet positions for the Edison base shell, one without a rivet. The missing side is the one to which the neutral power line connects. So the light worked if I pushed it in to touch the rivet, and only then. The iffy news is that the wires on the “new” 1980’s socket are a bit corroded. But my experience as a tinker and my degree in electrical engineering led me to think this was not a real issue. With CFL’s and LED’s it will never be carrying as much power as it was designed to. The good news is that the holes, indents, and threads of the 1980’s socket matched the mid-century light fixture. A perfect fit. So the true Object at Hand is the late 1800’s designed electrical screw-socket to mount light bulbs (generically known as an Edison Base) that are still made from ceramic and brass. On reflection, today’s object is an intro to one of my hobbies. I was slowly walking home from breakfast at the corner when I spied today’s Object at Hand in the street. A plastic rear view mirror from some toy vehicle that had come loose and been run over a time or two. I was walking slowly because of a lingering disease. Adult onset mono that had been misdiagnosed by a series of doctors who never considered that an old dude like me would come down with such a stereotypical adolescent ailment. Anyway, a couple of months after the symptoms got acute, I could walk to the corner. As soon as I saw this bit of plastic with its evocative printed decal, I flashed on a lifetime of travels. I began a travel blog back before most people knew the word “blog,” and wrote the code using Notepad. Before the blog, I would send emails to a list of friends with daily reports. Here is My Travel Page. I didn’t always love travel. As a child, I was always car sick. Back then we didn’t have air conditioning. During my tween and teen years, we didn’t even have rear windows in the car! So it was an ordeal for myself and my parents to go on the few road trips they dared: Once to Orlando (not including Disney, but backstage at Cape Kennedy as Apollo 13 was on the pad) and once up to Michigan to visit a great aunt. Plus an annual jaunt of 8 hours (back in those pre-interstate days) down to the Ozarks. Specifically Bull Shoals Lake just over the Arkansas border. Nope, not Silver Dollar City. I didn’t get to an amusement park until I was in my 30’s. But once I had a car of my own, we did drive. In our current sedan we have recreationally visited every contiguous state except Rhode Island and Wisconsin. We often travel the lesser roads, state and local highways. It takes longer to get to our nominal destination, but we really get to see America. The Object at Hand for today caught my imagination at a moving sale, as a perfect hook to write about a few things. I present for for your amusement (or at least my own), a common corporate giveaway item from the 1960’s: A United Airlines pocket knife. Now in the post-911 world of confiscating suspicious nail clippers, examining everyone’s shoes, and forbidding shampoo bottles, it seems hilarious that airlines once armed its passengers in this way. The blade in this is just 1½ inches in length, and was considered safe enough for airlines to distribute to passengers during the frequent hijacking era of the 1960’s and 1970’s. I dated the knife by the logo: United changed its letterhead regularly. This knife had to be produced between 1961 and 1974. Possession of knives was so casual in 1970 (when I was nine) that two aunts each gave me pocket knives for Christmas, at my grandmother’s house in Berlin. We then flew to Tel Aviv to visit my other grandmother, where I lost one of my new knives in the sand at the beach. No one thought anything about those 3″ blades in my carry on bag during any of the seven air legs of that trip. Aside: I remember lugging my carry on up those rolling stairways into a variety of planes on that trip: 727’s between Germany, Israel, and Greece, and JFK to StL; 707’s across the Atlantic; and the short steps up into a DC-3 from Eilat on the Red Sea back to Tel Aviv. There was a caged chicken in the overhead rack next to the barely caged fan on the DC-3 flight. We’d taken the bus down, to tour the sea of Galilee, Jerusalem, Bethlehem, and a few other sites for separating tourists from dollars. In that more innocent era, there were no metal detectors or enclosed jet ways, and family greeted us right at the plane in Israel, and at the gates in Berlin. In New York I recall a cheerful porter racing us through JFK from international to a United gate to barely catch our flight, because the scheduled 3 hour layover became 15 minutes due to traffic control issues in those days before weather satellites, computer flight tracking, and automated approach beacons. All these glancing observations evoked by spotting this little knife in a pile of cast off minutia at a moving sale. The title is a pun, for those who know English Country Dancing of the kinds we do in the three linked venues in this sentence. It is a move in which one person pulls another one gently around them by the hand, much like a swinging gate. Anyway, I was finally motivated to fix an alley gate in the rear of the property next to the one in which I reside. 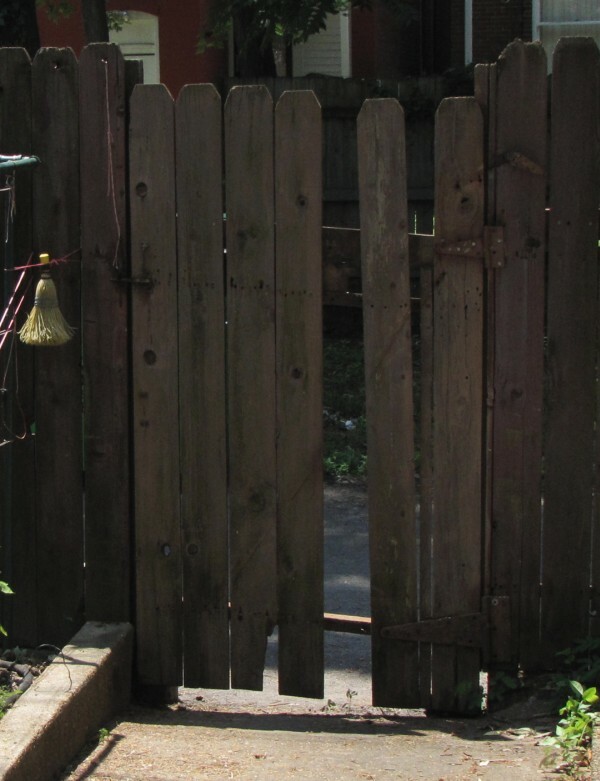 Back when the tech bubble burst, I built a new gate for a neighbor when I was considering non-computer remunerable activities (“jobs”). But other less sweaty forms of enterprise soon came my way. 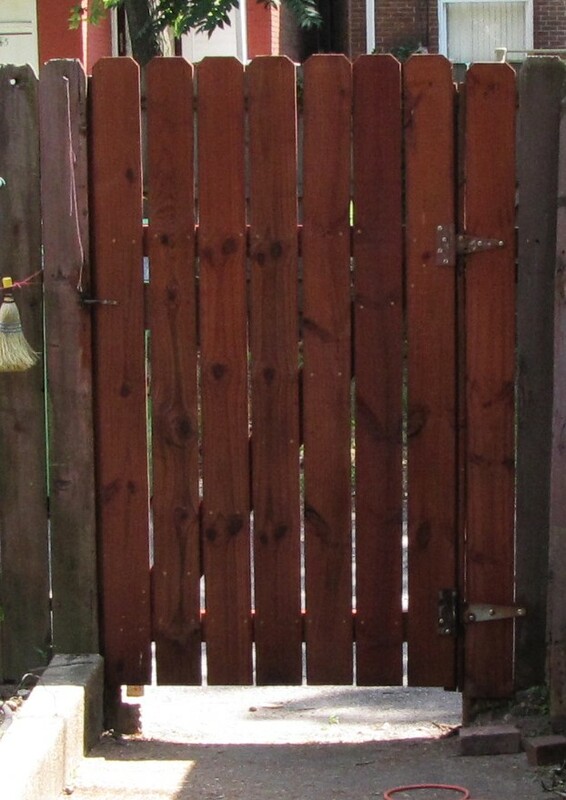 So it has been a dozen years since I have built a gate from scratch. This old gate had twice required repair already this very year. But the quarter century old treated and mistreated lumber was no longer holding screws reliably. Also, the gate had design flaws from the beginning: It was designed and built by the architect from whom I bought the building in 1986. As I have seen in many cases, architects are generally design artists, not students of engineering or livability. So I decided to engineer a new gate. I used modern treated wood, allowed it to age and dry for a while in the garage. Then gave each piece a good soaking with oil based penetrating redwood stain (a mix of red and yellow pigments, both of which retard biological growth (ie: algae, lichen, other rots). First, I had to reinforce the hinge side of the fence with a new upper stringer and a new fence board to support the hinges. Then I measured several times and cut only once per piece, working in the relatively cool shade of the garage this July 4th holiday weekend. I lined up the stringer boards parallel across saw horses. Then measured some more and put in the end fence boards cantilevered out to cover the jamb just the right amount. 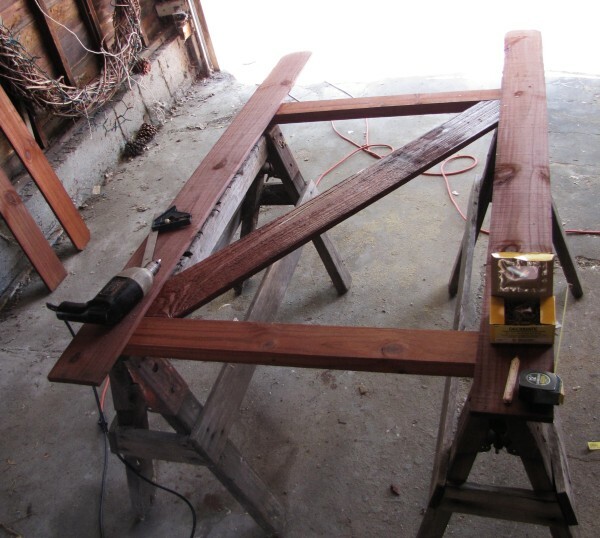 More careful measuring, and cut the diagonal tension web board to support the gate and prevent it from sagging over the next couple of decades. This web board is actually the missing board from the first picture. It was in good enough shape to be reused. Then I fit in the other fence boards by eye, and screwed everything up. Intentional cross-the-pond implied pun. That is, I attached all the parts with deck screws. Unfortunately, my screws of different lengths had different head types. Back around Y2K, square drive heads replaced the old Phillips heads. Now, those have been supplanted by Torx star drive heads. So I had to change my driver bit way too often, as I refuse to discard perfectly good weatherized screws just because they have been on my shelf for a decade. Anyway, the gate is now finished. My neighbors no longer have to wrestle with the gate to take out their recycling or trash. Sure, I used salvaged hinges probably from the early 1900’s, and the latch is one I bought at Central Hardware in the 1980’s. But those old parts can be expected to last out the life of this gate, and probably the next. So the Object At Hand here is the gate I built. Or the idea of a gate. Or even the use of the English Country Dance term to sucker unlikely people into reading this post. Here is a video that I put together of an English Country Dance performance for one of the three groups linked above. Yes, I appear briefly in it.